My physical body continues to demand more than my mind is capable of delivering. Today was the 5th Annual City Wide Citrus Harvest in Jacksonville, FL. This even consists of the Society of St. Andrew and Feeding Northeast Florida visiting homes throughout the city in an effort to salvage citrus that would otherwise go unpicked. I was a site coordinator for the 4th time (we have a total of five sites) in the five years of the event’s existence. My bout with bronchitis, showing progress towards victory but still far from over, saw me in a condition that left me disappointed in how I managed the volunteers. Six homes went untouched. But thanks to my wife, and the basic goodness of those who volunteered, we still managed to glean an estimated 26,000 lbs of citrus. The actual figure will be released in the coming weeks. What does this have to do with Seneca’s quote about the difference between a king and a tyrant? I needed to be a site by 7:15 am to begin setting up my table, chairs, forms to be filled out, tools for picking and the necessary act of greeting volunteers. I was operating on maybe 3 hours of sleep. I was coughing. My body was aching. I haven’t had an appetite in days so my blood sugar was far too low for the activity required over the next 4 hours. There were around 100 people looking up at me when, at 8:15 am, I began to explain what this effort entails. That what we pick will feed people across seven counties. That every year the volunteer count goes up, the weight in citrus picked goes up and we inevitably pick up more houses for next year’s event. There are families, church groups, business and single individuals who participate, and it is my job to take all the data supplied to me and create temporary communities of people. These communities will drive to homes and pick fruit. At my site we had 54 homes to visit before the end of the day, designated as noon. This morning I had to look beyond my own malaise and represent the charitable organizations who entrusted me to be their spokesperson. The volunteers didn’t want to see some guy complaining about not feeling well. Telling them that he’s sorry it wasn’t be run better, but he’s doing the best he can. I needed their help. I needed to be a good leader. This wasn’t about me, or how I felt. Hero or Nero are extremes. We need simply be good for the sake of things other than ourselves. Be a thoughtful friend, co-worker, spouse, student, consumer or neighbor. Are we edifying our community? Is our focus on justice and fairness, or are we simply looking to get what we want? Are we demanding things from others that, if thrust upon us, we’d recoil? We should seek the best from ourselves, and others. We should work to be the leader we look for in others. Once again Feeding NE Florida and the Society of St. Andrew are teaming up to help glean citrus from neighborhoods in Jacksonville, FL. I will be a site coordinator for the third time, and am very grateful for the opportunity to bring together our community with the common goals of eliminating waste and feeding those in need. Please click on the link below for information on this wonderful event. This past Saturday was the Second Harvest City Wide Citrus Glean in Jacksonville, FL. Officially the title is qualified as “Second Annual” as it was the second hear Second Harvest and Society of St. Andrew (SoSA) coordinated efforts to feed the hungry by picking fruit that would normally fall and rot. My role was retained from 2013, which meant the responsibility of site coordinator for the San Jose area. Last year we had approximately 20 volunteers, and those could not reach all the houses on the list. Sunday found me gleaning an additional three homes. However, this year the volunteer count was approximately 80, which meant all houses on the list had their trees picked clean. Thanks to the work ethic of those in the field we were able to glean from an additional three houses. Those volunteers were out from 9:00 am until 2:00 pm, and thanks to the weather the day was more redeeming than expected. “Almost 15 percent of households in America say they don’t have enough money to eat the way they want to eat,” Seligman said. Recent estimates show 49 million Americans make food decisions based on cost, she added. In about 4 hours on a chilly Saturday, over 400 volunteers were deployed to pick from about 130 homes. Total: 26,349 lbs of citrus! This was a slight increase from last year, which considering the freeze this year is good. I could not find my data for San Jose from last year, but I know we were far above that count. 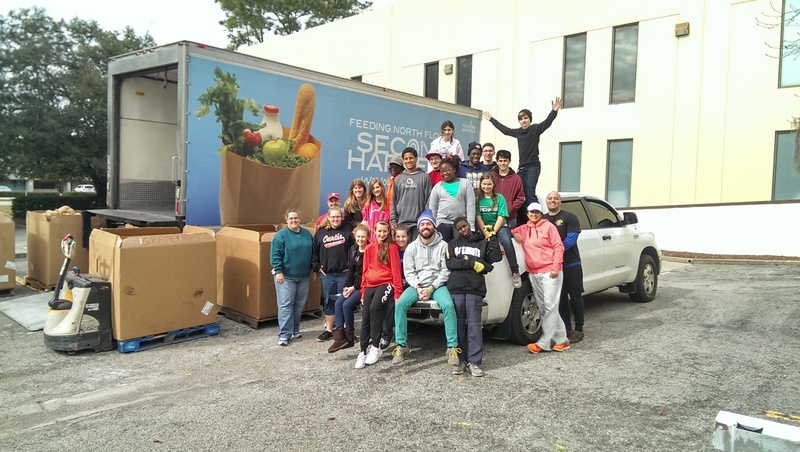 Gleaning is a great way to meet new people and to be a positive impact for change in the world. I work with SoSA. Find one in your area. Gleaning season is upon us. With the success of last year’s event the need for this year is even greater. Please considering volunteering at the most convenient site based on your location. The information below is directly related to the site I am coordinating. Happy New Year everyone. Based on previous conversations you had expressed interest in or have agreed to help with the 2nd Annual City Wide Citrus Glean. Below and attached is information specific to date, time, location, effort and contact information. Please ensure timely registration for the site I’m coordinating so Second Harvest can better understand any volunteer shortages and allocate accordingly. Please forward this email to anyone you feel may also be interested in this event. Additionally, this volunteer opportunity will help satisfy Bright Futures requirements. We may work beyond the designated stop time. Your participation is not required during or beyond the 4 hour window; you may leave as your schedule warrants. Last year this drive brought in over 24k lbs of residential citrus in about 4 hours! Since then, the word has spread, and our donor database has DOUBLED. That means we will need at least twice as many volunteers to accommodate all the additional homes, but it also means our goal for this year will be 50k lbs! The ages of those who volunteered for my site last year ranged from 8 years old and up. If you plan on brining younger children please be advised that falling fruit can be dangerous so proper observation should be maintained. I will be supplying limited hard hats, bags for collecting fruit and a variety of gleaning tools. If you have your own clippers or other gleaning material please feel free to bring them, but label them accordingly so they do not get mixed in with my tools. Following are more detailed elements of gleaning, and specifically this event. I have attempted to preemptively address as many questions as possible, but I have no expectation all have been considered. If you have any questions please email, text, tweet or call me. I will make every effort to facilitate any registration questions. Should you need help beyond my ability please contact Second Harvest directly via information from their site. Attached is the liability waiver form that should be filled out, signed and brought to the gleaning event by everyone who is volunteering. Attached is the official flyer for the event. WEAR: Close-toed shoes (required) and clothes you don’t mind getting dirty. It is also recommeded to bring a hat and gloves as needed. I would argue gloves are a necessity as you may be dealing with trees containing thorns (Myers Lemons) or can be scratched up by tree branches in general. BRING: Plenty of water and liability waiver forms as well as any medication you may need, sun screen, bug spray and snacks as needed. If you have a bucket or a cloth grocery bag to pick fruit into and a citrus picker, please bring that too! If you are lost or running late please call me. I will be supplying maps and contact information for your target homes to facilitate ease of access. NOTE: Bathroom access may be limited, please use the restroom before you arrive. Last year access was given to the church, however bathroom access while gleaning should not be expected. These numbers are not absolute and I will work to facilitate groups/families are allocated to common sites. Call ahead to each donor location to let them know you’re coming / gate access. Ring doorbell upon arrival. Donors have been contacted and confirmed prior to scheduling. Donors have been notified of the date and time frame of gleaning. Please no horseplay; these are people’s homes. BE RESPECTFUL. Only go into areas assigned and stay in groups that will be assigned on site. Do not bring any pets, no exceptions. Pickers go out to the homes and collect the fruit. Pickers with pickup trucks are especially valuable. Vans and SUVs are useful as well; the trunks of standard cars fill up too fast. Home recycling bins work wonderfully; they are the right size and very sturdy. Thank you for helping us ensure those in need are getting fed, and that food is not going to waste. Tomorrow Change-Can, through Society of St. Andrew, will be participating in the Second Harvest of North Florida city-wide citrus glean. It is a wonderful effort to engage the community to donate their citrus that would otherwise go to waste. Many volunteers have given their time on a Saturday morning harvest the citrus so Second Harvest can distribute it to those in need. I am honored to be the site leader for The Church of Jacksonville location. Fill out a waiver. If a family is participating only one waiver is needed for the primary and all family members can be added to the back of the document. Review the rules for approaching residents, picking fruit and gleaning the site. Get assigned to one of two groups. Get assigned your map of sites which will include name and phone number of the resident. It is recommended you call them prior to arriving. Get the appropriate tools. I will have fruit baskets, clippers, hooks and sheets to catch any soft skinned fruit. I will also have hard hats for those gleaning grapefruit trees. You will need to bring your own gloves. I also recommend something long-sleeved as some trees, specifically lemons, are thorny. Get cards thanking the residents for their donation, which also doubles as a receipt for tax reporting purposes. Some of the volunteers will need to remain at our home base to receive the fruit and put it into the bins for transport. I will make every effort to ensure volunteers go out with friends and family but it is important to note that both groups will need experienced gleaners so you allocation will need to be governed by experience. For more information please visit the Second Harvest of North Florida website. You may contact me directly through Facebook, Twitter or by responding to this post. If you are reading this and have a citrus tree you are more than welcome to bring the fruit to any of the locations between 8:00 am and 12:00 pm. Better still if you would like to schedule a glean please contact me and I will visit your residence. 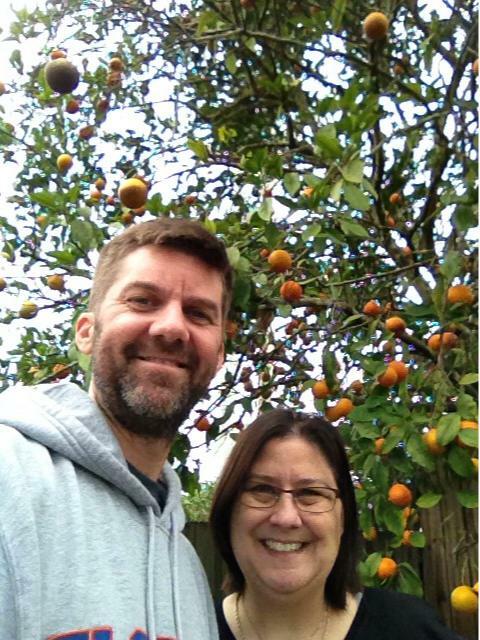 Vicki Poole and me in front of her orange tree. December was a tease but January delivers! New Years Eve found me with a welcomed email from my good friend Sandi Newman, NE Florida Gleaning Coordinator for Society of St. Andrew. Citrus gleaning is occupying the month which means multiple opportunities to help those in need. For students this is a great way to satisfy your volunteer hours and for family/friends a chance to spend quality time together for a worthy cause. This Saturday (1/5/13) we will be in Satsuma, FL picking grapefruit, oranges and tangerines. For new gleaners this means 1) wear a hard hat and/or be very alert because falling grapefruit is hard on the dome, 2) snippers and blankets will be in order as falling tangerines explode on impact and 3) sampling some of the best citrus you will ever taste. Satsuma is one hour south of Jacksonville off of US-17. I will have address confirmation later today but as always I can travel with the Tahoe which means I can seat nine. Reach out to me via Twitter (@iambwf) or comment on this post if you would like information on participation. For all “friends” Facebook, call or text me. The rest of the January calendar is below. My only weekend of no gleaning will be January 12th as Chris Gandy and I will be up in Caesar’s Head, SC. Saturday, January 26: City-wide Citrus Drive with Second Harvest North Florida food bank. There will be 5 locations in Jacksonville to drop off citrus or to volunteer to help pick citrus from backyard trees. There are also gleanings going on Wednesdays in the Arlington/GrovePark areas and on Thursdays in Orange Park/Fleming Island/Middleburg. Please ask! And remember, you can make a direct impact by talking to neighbors who have citrus trees who might not be using all their produce. If you see any homes while traveling which might be gleaning candidates, but you do not want to make contact with them, let me know the address/location and I can stop by to ask if they would be willing to donate their yield. 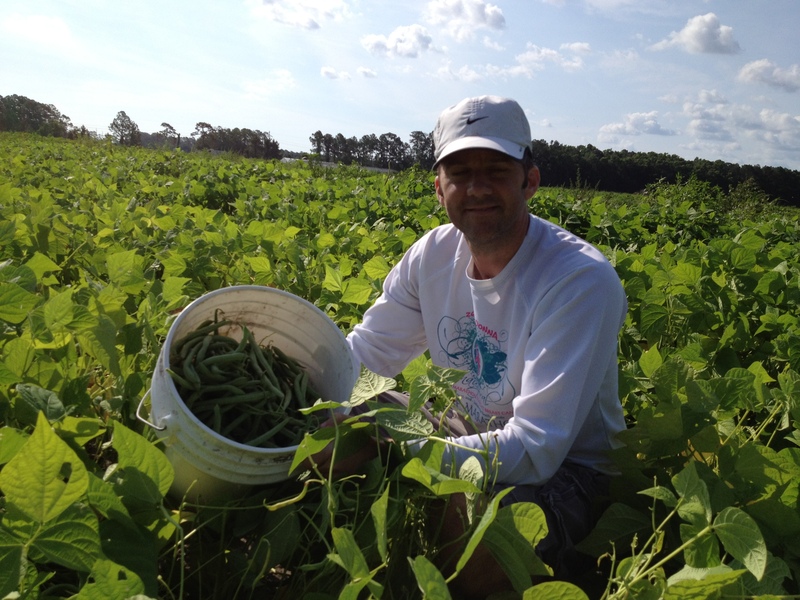 Gleaning – All the Beans!!! Gleaning is back with a vengance! Well, for me it is. Unfortunately the opportunities have recently been solely weekday, so when Sandi sent the email asking us to be at the ready for this past Saturday my wife and I blocked out the time. The morning was spent at the KYV farm off of 16A which is near World Golf Village. It was a beautifully crisp Saturday and the first vegetable glean. Our target crop was green beans and while a bit less demanding than picking citrus there was considerable effort needed to maneuver through the bushes so that we did not destroy the entire plan. Adding to the joy of working the land again was a fact I would learn latter: this land is owned by a friend’s brother! Nice to be part of that circle. Our responsibility was a delivery to Waste Not Want Not and our yield for them was 53 pounds. I have no idea whether that is good or bad harvest but it sure looked like a lot of beans! Here is the email from Sandi letting us know how successful the day was as well as what opportunities are upcoming. Good morning gleaners! Last Saturday, 14 volunteers enjoyed a breezy morning in the bean field, picking 300 lbs. of tender, delicious green beans. We’re returning to the farm this Wednesday morning at 8:30 to see if we can harvest another few hundred pounds before the plants are pulled and the field put to rest for the summer. It would be great if you could join us for a few hours to see if we can’t “rescue” these beans for the agencies we serve. I also have the following dates set for gleaning: Saturday, 5/19 and Wednesday, 5/23, potatoes in Hastings; and Saturday, 5/26, cabbage in Wellborn (near Lake City/White Springs). PLEASE respond to this e-mail if you are available for any of these dates, and I will send directions and details. The cabbage gleaning is a welcomed opportunity because it means coleslaw! Also, it is near an area to camp and kayak should anyone want to make a day of it. As always, the vehicle has open seats and I would love to spend the day with anyone who can make the time.